A crowd of approximately 40 people, small but united and loud in their fight against pipelines, gathered in Norman Bethune Square at noon on Feb. 1 to deliver a petition to TD Bank, urging the bank to remove its investments from the Dakota Access Pipeline (DAPL). The petition had more than 143,000 signatures on it. “We’re here to honour what’s going on over there in Standing Rock with the Sioux Nation,” said Dan Parker, a representative from Climate Justice Montréal, the group that organized the event. Parker introduced the event’s first speaker, Sierra Segalowitz, a Native youth ambassador. “I’m Inuit, Dene and half French, and I’ve been involved with these types of things since I was a baby,” Segalowitz said. Segalowitz recites a speech from Black Elk Speaks. Photo by Savanna Craig. “If the old camp circle, the sacred hoop of the Lakota, and the old days have been rudely shattered by the machines of a scientific era and if they can be no more in the traditional sense, the universality of the images and dreams must testify to the emergence of a new sacred hoop, a new circle of intense community among Indians far outdistancing the grandeur of former times,” she read. “He’s not alive, but he predicted this hundreds of years ago,” said Segalowitz, referencing ongoing pipeline conflicts throughout North America, including the one at Standing Rock. “We are standing strong and we are standing for our Mother,” said Segalowitz. Kristian Gareau from Climate Justice Montréal reminded the crowd why they had gathered. “We’re Climate Justice Montréal, we’re people who fight for the respect of the Earth. We see everything that’s going on around us—it’s very discouraging,” said Gareau. * He said what inspires him and other members of Climate Justice Montréal is seeing the protectors of water and people from First Nations communities all over the continent who are standing up against the constructors and powers behind these pipelines. 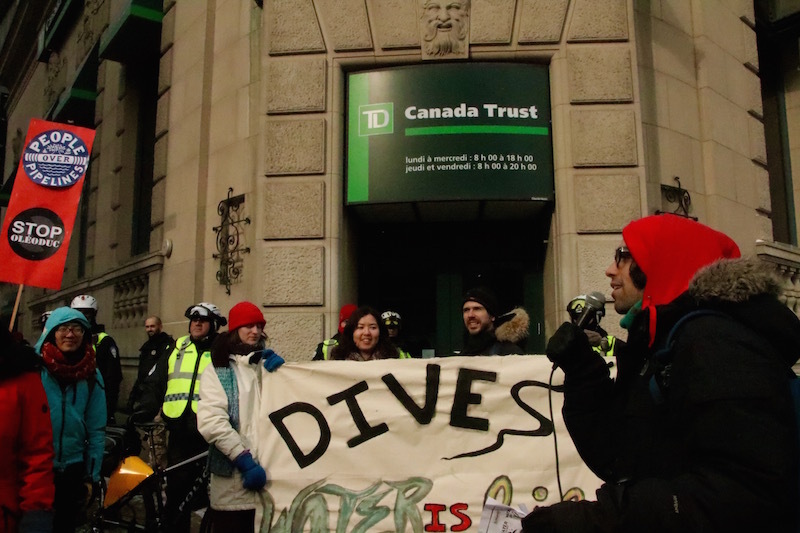 Gareau said the demonstrators would march to two TD Bank branches in Montréal to deliver petitions insisting the bank remove its funding from the pipeline project. Kristen Perry from Climate Justice Montréal told the crowd they were responding directly to a call from Standing Rock that urged activists across North America to petition the banks in their area that are funding the construction of the DAPL. Police gathered outside TD Bank location at Ste-Catherine and Guy. Photo by Savanna Craig. “You can’t eat money, you can’t drink oil, give it up TD, leave it in the soil,” chanted Parker, along with the crowd. Representatives from Kahnawake’s People’s Fire marched alongside activists down Guy Street towards their first stop at the TD Bank on the corner of Ste-Catherine West and Guy. Gareau delivered the petition to representatives at TD, as demonstrators sang together outside the bank, which was heavily guarded by police officers. As Gareau exited the bank, he told the crowd he had informed the bank’s representatives that they do not want TD to fund public money into dangerous and toxic infrastructures that infringe treaty rights. “City by city, block by block, we stand with Standing Rock,” chanted the crowd as they marched towards Place des Arts, to the TD Bank on Ste-Catherine West and de Bleury. “They actually had heard about Standing Rock, which is good. I think it’s something that’s been in the media a lot,” Perry told the crowd after delivering the second petition. “We’re calling on TD again to take their money out of Dakota Access Pipelines,” said Perry, as she urged participants to close their TD Bank accounts. Protesters gathered at the TD Bank location on Ste-Catherine West and de Bleury. Photo by Savanna Craig. “I don’t think the pipelines are good for the Mother Earth,” Segalowitz told The Concordian. “[Climate Justice Montréal has] three main motives: we do mobilization, like today, we do education—where we give workshops—and then we do direct action,” Parker said. He told The Concordian that, in the three years since he joined Climate Justice Montréal, they have not organized a lot of direct action. However, Parker said recently they have been organizing protests against Line 9, which has a refinery located in Sarnia, Ontario—close to a reserve home to members of the Aamjiwnaang First Nation—running all the way to Montréal. Parker said Climate Justice Montréal has been helping indigenous land defenders, such as Vanessa Gray, who shut off a Line 9 valve in December 2015.